I love your creation. Very cool design and wonderful craftsmanship . Love how this turned out,you did a wonderful job with those seed beads. Isn't it wonderful when necessity causes us to think outside the box and the result is so beautiful. Great piece! Awesome as usual! I love how your "accident" turned out! I was trying to do something similar with some earrings...but right now my hands are giving me a fit...carpel tunnel....so I will just admire your work! Great design. Awesome job. Thanks for posting! I love your necklace, Alicia! I am in awe of your nifty wire skills, (and your ability to work with those tiny beads). I was smiling and saying "yay!" out loud as I read your post. Thanks for being in the hop! How beautiful!! You're right - forest, organic and what a fun necklace! Thanks for sharing how you made your necklace - I'm going to have to give this a try! Oh my goodness Alicia - this is absolutely beautiful! I love the organic feel of the design, and the colors are fabulous! A lovely piece and so fitting to the theme. I love your solution to the needle! You created an amazing mix of texture in your organic design. Love the twisty wire wrapped feel of it. Very sweet. You have a right to be proud of your baby! Wow..your creation is sooo pretty... I think you got it all perfect to the theme. Love your blog and absolutely love your necklace. It is stunning. Brilliant solution! What you did with that wire was inspiring and cool. I love wirework as my first choice technique too! 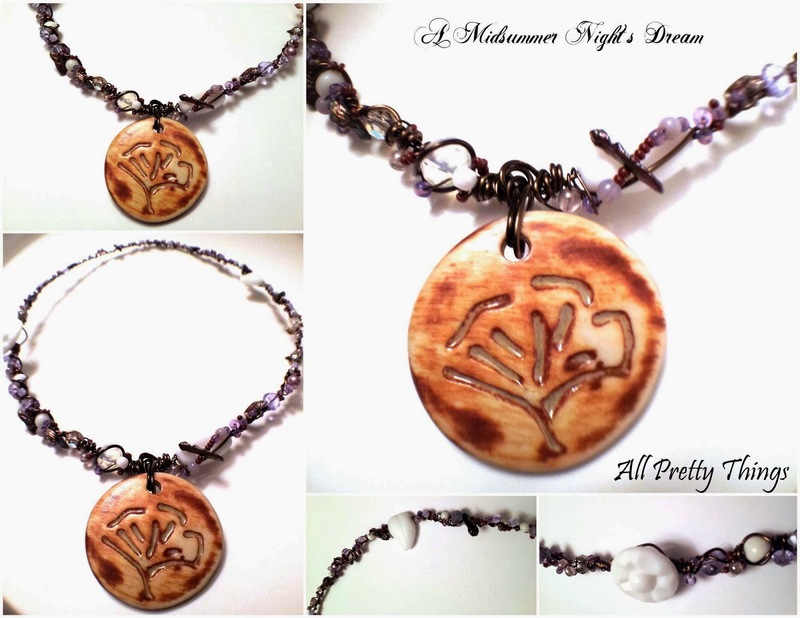 "Midsummer's Night Dream" is indeed very cool & I agree with you -- how absolutely gorgeous those small beads look embraced by the wire, and how beautifully you've balanced each aspect of the necklace: the pops of creamy white (like snow here & there in the woods!) in the button clasp and within the design as well as the rich glow of the pretty pearls keep my eyes moving fluidly, effortlessly. The deeply colored wire against the gentle shades of lilac, lavender, iris, light purple and white celebrates both beads and wire. Lovely! And indeed, beautiful, beloved and definitely way cool! This is a very pretty necklace. I love the focal and the way you wrapped everything and wove everything through and around all the beads. Very earthy and organic indeed. Just gorgeous and very clever! 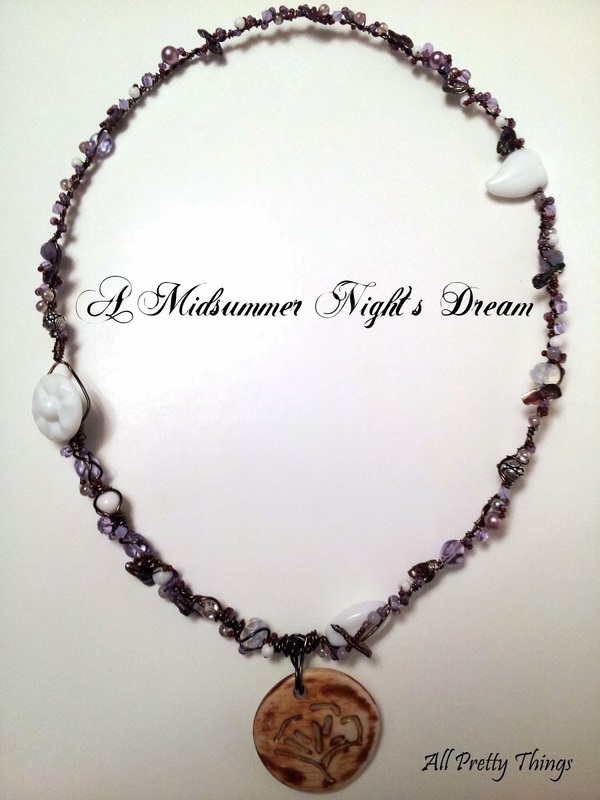 And definitely fits your Midsummer Night's Dream theme!